The Way of St. James is likely one of the most trafficked pilgrimages in existence. 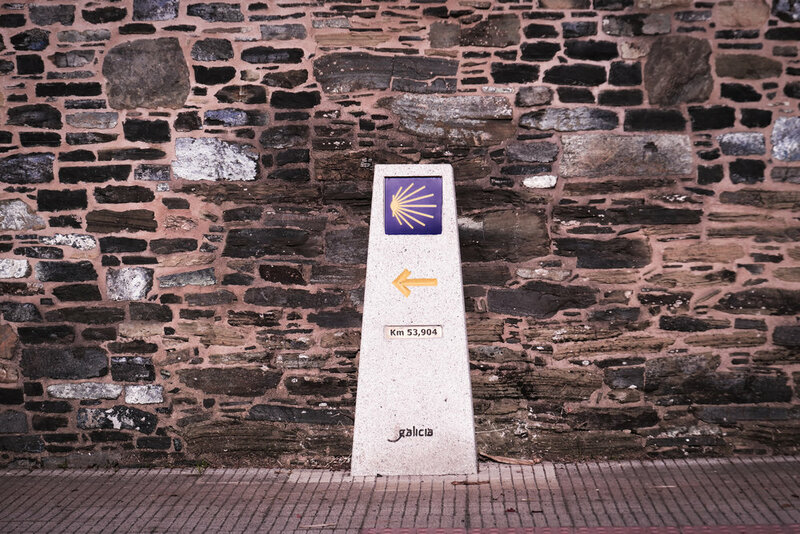 This holy walk takes people from around the world to multiple courses that begin in various locations but culminate in a trek across Spain that ends in Santiago de Compostela, which is believed to be the burial site of St. James' remains. This walk will take you through beautiful small towns, across the Spanish countryside, next to towering castles, and through bustling metropolises. It is a journey that many take for very different and personal reasons, but it guarantees lasting lifetime memories, some challenges, and likely some new friendships. There are yellow arrows indicating the way across the entire journey - you won't get lost! For the true experience, don't plan your accommodations/meals, etc - just walk and know that "the Camino always provides"
This is a photo of the map included in my Pilgrim Passport. Note the distances of each city from Santiago as well as the distances to the next city. These maps typically only mark major stops, you would usually have sleeping accommodations in small towns between the major cities as well. There is one single important thing that most people do before they depart for Europe (well, other than booking a flight to and from, obviously), and that is obtaining their Pilgrim's Passport (credential). You will need to allow at least 1 month for most national offices to process it, and it will cost between $20-40 (administrative fees, I'm guessing). If you want to put your mind at ease, head to the American Pilgrim Org site here or whichever nation you hail from and order your credential. There is a more unique way, though, that I found to be more authentic. I arrived to Spain without a credential (I did order one, but it did not come in time). I was forced to seek out my document in Madrid, which led to the very cool experience of receiving it from a cathedral in which the priest brought all the pilgrims to the front after the service and gave the pilgrim's blessing, wishing us safety and self discovery on our journey. I paid only 5 euros for my passport, considering it was for donation only, and had it in a matter of minutes. I'd recommend this process if you are the adventurous type. Head to the Church of Santiago in Madrid (since you're probably flying in their anyway, reference google map on the right), and you'll find an admin office in the back opened up after the day's mass (schedule is posted on the door). Seriously, it was just a really neat process and everyone I encountered on the Camino thought my passport was the nicest one they'd seen (all of theirs were from national offices that insist on using Comin Sans). 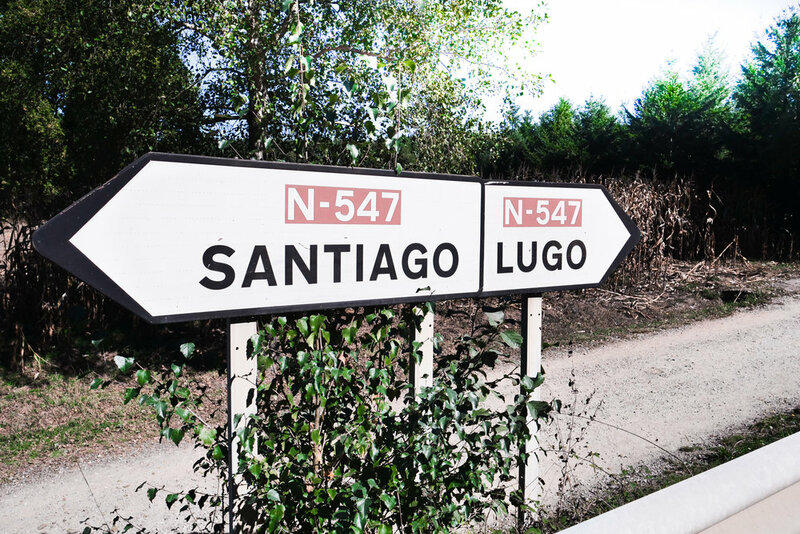 By starting in Lugo, I managed to experience three separate Caminos (North Way, Primitive Way, and the French Way). A typical pathway between towns on the Camino. Note I'm wearing the bare minimum, moisture wicking clothes and a backpack *with* a waist strap. The goal here is to pack light, because you'll be carrying everything you decide to bring on your back, and you will undoubtedly accumulate a few things as you make your way. In that spirit, I honestly recommend you only bring 2 pairs of clothing. One is for hiking, the other is for the evening/sleeping. Maybe bring a light jacket or a long sleeve shirt as well, but I managed fine without a jacket and was only cold one morning (which I comment about in the video). You will be doing your laundry each afternoon with concentrated detergent (this stuff is great), and you'll hang it up to dry at night. Once every few days you'll wash/dry your sleep/evening wear as well. Considering you're hanging stuff to dry (on your bunk bed, on a line outside, wherever) you should attempt to bring synthetic moisture wicking type material rather than cotton or wool. Bring a set of flip flops that can double as shower shoes and walking to the café for dinner after your day's trek. For sleeping, a bag liner with some sort of insect repellant applied will keep you plenty warm and give you peace of mind as you hear rumors of bedbugs on the Camino (I didn't encounter any). I used this bag because it got good reviews and it performed very well (also packs down small). You won't need to bring a pillow or blankets. You'll be sleeping in Albergues mostly, which is very much a hostel with bay area sleeping. I had a night or two with some loud folks near me, and this mask/ear plug combo will be a lifesaver. For electronics, your typical travel adapter will do. I've had this one on a few trips and it's awesome because it has USB ports and works in any country. You're probably wondering what I'd recommend to carry all of this? 95% of the pilgrims you come across have a serious hiking backpack. Then again, I didn't want to purchase such a behemoth for my week long adventure, and decided to bring my Northface Recon backpack because I already owned it. Believe it or not, I managed to make it work, and that included bringing an iPad, a DSLR, external microphone, batteries, etc. My only point of contention is that your typical backpack doesn't fit as properly nor bear the weight on your body as that of a real backpack. If you decide to go super minimal like I did, make sure your bag at least has a waist strap you can utilize to take some of the pressure off of your shoulders. Next time I go, I'll bring a real hiking bag, but the backpack did work out okay. You won't get lost! These markers are at every intersection and tell you how far you are from Santiago. Also, there will be yellow arrows painted on walls, the ground, trees, light poles, trash cans. Just be sure to keep an eye out, because sometimes the path veers off and you'll be engaged in deep conversation only to realize you haven't seen any other pilgrims for 20 minutes. There is one phrase you will hear (and say) repeatedly as you make your journey: "Buen Camino". Loosely translated as good way/good journey, it is both how you greet and say farewell to those passing by or new friends. If you haven't watched the video above about the daily "ops tempo," I'll lay it out for you. Each morning in the Albergues you will be required to leave by 0800 - this is a hard deadline as they have a ton of beds to quickly turn over for guests that may be arriving as early as 1200 that day. This means that most pilgrims wake up, either in the clothing they will hike in, or do a quick change and are on their way. My buddy Jed and I were literally the last ones out of each Albergue because we both wanted to brush our teeth, wash our face, maybe fix the bed head, etc before starting our walk. Nevertheless, it's a 0800 departure (usually) at the latest, otherwise you'll have a Spaniard hurrying you along by clapping at you as if you were pigeons they could scare off. Once you start your walk, you'll see pilgrims have stopped here and there at a café for their coffee and croissants. Definitely do this; you'll need the caffeine and the carbs for the 30-ish KM you'll cover. Be sure to get your stamp if the café offers one. I kept a water bottle with me and filled it here and there, but really never found myself in need of how much water I was carrying. Anyway, you'll walk until around lunch and probably stop again, unless you packed something, in which case you'll have plenty of scenic places to hang out and eat (picnic tables here and there). Most folks will walk until 1400-1600, with the window being so wide because they begin to check for vacancy in whatever town they are passing through. You may find accommodations with vacancy, but don't really feel the 'vibe' so you decide to keep pushing. Or, consider finding an Albergue with a perfect café attached, a beautiful view, and some new friends have already decided to stay, but it's only 1300...what are you likely to do? You'll stop, because the extra time is only going to allow you to split a bottle of wine later with these new comrades. Once you check-in, they will make you remove your boots immediately. They'll show you to a bed and essentially leave you to do whatever you need to do. I always went straight to doing my laundry (washing 1 shirt, 1 shorts) so they had ample time to hang and dry. Then get your shower in and enjoy the awesome feeling of wearing flip-flops and having the free time to stroll through the town you're in and find food and drinks. Maybe you've stopped in a larger town with multiple cathedrals and castles to view, so you decide to stay an entire extra day. Maybe you decide to pamper yourself and spring 30 bucks on a legitimate hotel with privacy. Maybe you didn't check in until 1700 and you have just enough time to do laundry, shower, eat, and then it's straight to sleep because most locations have a mandatory 'lights out' at 2200. The point I'm making is that the spirit of this journey is essentially accepting that it is a journey. Pilgrims of old did not have booking.com to arrange their accommodations. They did not have travel books to tell them exactly which restaurant to eat at. Nor did they have the demanding careers/lives that we have today that inject stress in a time that should be mostly a "go with the flow" type experience. I hope you're able to 'let go' and enjoy what the Camino has to offer: the opportunity to just walk, and after you've walked for the day, you've met the day's objective, and their should be little reason to dwell on tomorrow because tomorrow you will do the same thing - just walk.